What will happen when the Lake Oswego and Jesuit football teams meet in the state semifinals on Friday? Who will rule the day? Will it be Jackson Laurent, Casey Filkins and the 11-1 Three Rivers League-champion Lakers, or will it be Will Spitznagel, Andy Alfieri and the 11-1 Metro League-champion Crusaders? Why not just ask who wins in the proverbial matchup between the immovable object and the irresistible force? While those questions may not be answerable in advance, there is a lot we do know about these two talented teams. First and foremost, the Lakers and Crusaders will meet at noon Friday at Hillsboro Stadium with a berth in the Class 6A state championship on the line. 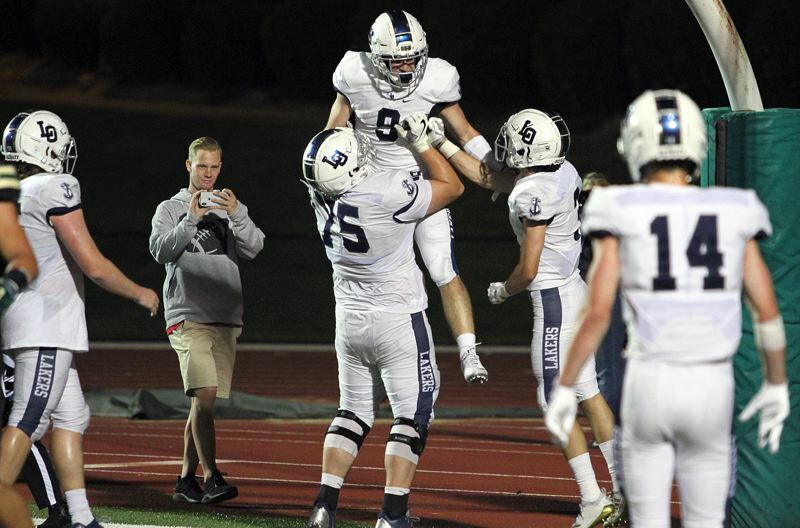 "They have some good wins, and we picked up a big one tonight — we'll be ready for the challenge," Lake Oswego junior tight end/defensive end Marshall McGuire said after his team's quarterfinal win over Central Catholic. "There's definitely a sense of wanting to get back," said Lake Oswego coach Steve Coury before the quarterfinal. "But they don't talk about the past, and that's why they've been able to perform. ... I think they've got it in perspective and they know what it takes mentally to get there." On their side of the coin, the Crusaders say they are ready to beat the Lakers in the biggest game of the year to date. "We've gotten a lot better since we played them the first time and so have they," said Jesuit senior lineman Joe Quillin. "They're a good team (but) we're going to come out ready as ever and take care of business, hopefully." "When we played them we only had a couple of game films, but now we're going to study a lot more," said senior defensive back Gary Hollands. "They have a lot of good athletes, but so do we, so we're going to be ready for them." The top-ranked TRL champion Lakers have already beaten 32nd-ranked North Medford 42-6, No. 16 Oregon City 49-14 and No. 8 Central Catholic 35-24. Their lone loss this year came in a controversial 49-39 defeat at Clackamas back on Sept. 21. The fourth-ranked Metro champion Crusaders have already beaten No. 29 Grant 56-7, No. 20 Reynolds 45-7 and No. 5 Tigard 23-22 in the second season. Their lone loss this year came in a 20-14 setback to the Lakers back on Sept. 7. Lake Oswego enters the game carrying an eight-game winning streak and has outscored its 12 opponents this year by an average margin of 39-19. Jesuit, meanwhile, has been even more impressive, entering Friday's game with a 10-game winning streak after outscoring its 12 opponents by an average of 46-16. On offense, the Crusader are led by their seven first-team all-Metro selections, senior quarterback Will Spitznagel (6-foot-1, 173 pounds) — the Metro League Offensive Player of the Year — junior running back Andy Alfieri (6-3, 210), junior slotback Joey Gatto (5-7, 155), junior fullback Logan Horton (6-1, 225), senior center Seth Monahan (6-1, 240), junior lineman Shea Brooks (6-6, 214) and Quillin (6-2, 280). Spitznagel has thrown for 1,922 yards and 28 touchdowns with seven interceptions while completing 71 percent of his throws. 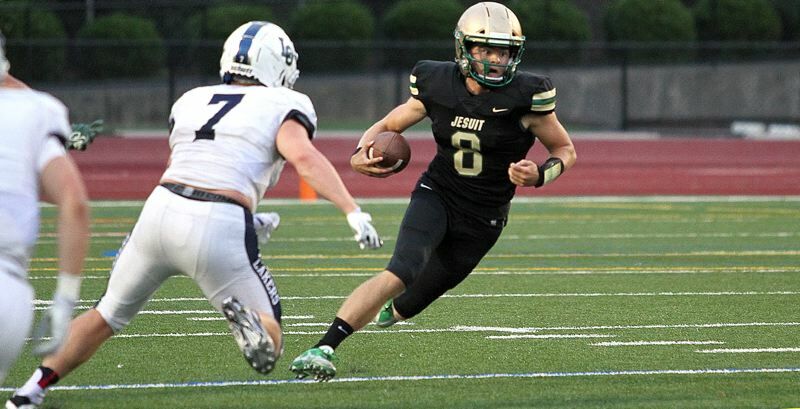 Alfieri has racked up 1,013 yards and 13 TDs on 141 carries, Gatto adds 516 yards and three scores on 37 catches, and the Jesuit line has helped the team rush for an average of 285 yards per game. All-league second-teamers from the Jesuit offensive unit are 6-4, 220 senior tight end Colin McMahon (355 yards and nine TDs on 37 catches), 6-2, 211 senior lineman David McDougall and 6-0, 191 senior wide receiver Josh Daul (441 yards and six TDs on 32 catches). On their side of the ball, the Lakers appear to be returning to full health, with both senior running back Collin Bracken and junior running back Casey Filkins in action last week. Lake Oswego is led by the following all-Three Rivers League first teamers: senior quarterback Laurent (6-1, 200), Filkins (5-11, 185) — the TRL Offensive Player of the Year — junior wide receiver Thomas Dukart (6-1, 175), senior tackle Tanner Hall (6-1, 225) and senior guard Ryan Bertelsen (6-3, 285). Laurent has thrown for 2,703 yards and 27 touchdowns with just two interceptions while completing 66 percent of his throws. Filkins has rushed for 1,020 yards and 23 TDs on 148 carries, while Dukart has made 41 catches for 790 yards and 10 scores. The Lakers' offense will also look to second-teamers McGuire (6-3, 220), Tiger Shanks (a 6-6, 330 junior tackle) and Mo Linver (a 5-11, 250 senior center). On defense, the Crusaders are the state's second-best unit, allowing just 15.6 points per game and trailing only unbeaten Clackamas and its 14.4 points per game allowed average. Jesuit's defense is led by four first-team all-Metro picks, Alfieri at linebacker, Quillin on the line, Daul at defensive back and senior Zach Carr (6-2, 214) at linebacker. Second-team picks for Jesuit include senior defensive back Gary Hollands (5-8, 140) and senior defensive lineman Tom McBratney (6-3, 210). For Lake Oswego's defense, leaders include sevn first-team all-TRL picks: senior lineman Mike Mercep (6-2, 220) — the TRL co-Defensive Lineman of the Year — McGuire at end, senior linebackers Gabe DeVille (5-11, 195) and Keenan DeRaeve (5-10, 180), junior defensive back Joe Hutson (6-1, 160 and the team leader in interceptions with four), senior defensive back Matt Sebolsky (5-10, 165) and Dukart at safety, and second-team selection Bryson Breeze (a 5-11, 190 senior linebacker). Jerry Ulmer of OSAA Today contributed to this report.